The euphoria of equity markets over the last 2 years has increased the risk tolerance of many investors. 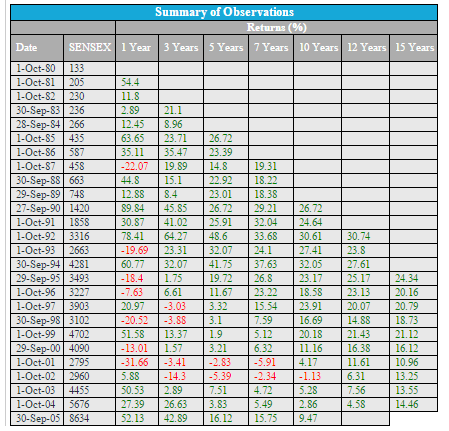 The data below captures Sensex returns over the last 36 years. Though equity has given a greater than 15% compounded return, there are long periods wherein returns are sub par. For the period ending Oct 1 1997( 92-97) the compound returns are a measly 3.32%. Note this process of sub par returns continue till Oct 2004. Similarly has been the 5 year returns of the Sensex for Oct 2011 ( 2006 to 2011) has been a meager 5.73%. The pattern continues till date. Disclaimer: Mutual Fund Investments are subject to market risks, read all scheme related documents carefully.